It’s tough for Division II players to make it in the NFL. It’s especially tough for Division II players with mediocre 40-yard-dash times. Okay, there’s Jerry Rice. And, yes, Walter Payton. But they’re the exceptions. Joique Bell hopes to become another. 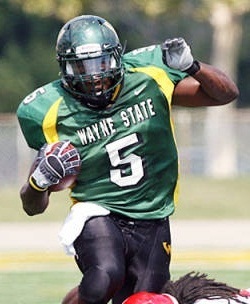 The Wayne State Warrior led the nation with over 2,000 yards rushing, earning the Harlon Hill Trophy (D-II Player of the Year). He talked to PD this week about his love of football and his hope that, when evaluating him, teams look at his film (below) more than his 40. I wanted to ask you what it has been like to go from a small college atmosphere to the national stage over the last couple of months. Oh, it’s been very exciting. It just points out that – not only for me, but for my teammates and all the D-II players and all that – knowing that talent can be recognized. If you have talent, they will find you. This is a testament to that, so it’s a blessing to even make it this far. And what was it like, going to the combine, for example, when you’re surrounded by players that have gotten so much national exposure? It’s not really that big of a transition. You know, they do the same things I do; I did the same things they did. I didn’t get that much exposure, but I look at the other players as human beings. I don’t put anybody on a pedestal; I look at everybody at the same level, because right now, none of us are in the NFL yet. After that, I just look at everybody as level, I don’t put anybody above anybody else. When I went down there, nobody acted like they were above anybody else. It was a good atmosphere to be in. You meet a lot of new guys and make a lot of new friends, make some good contacts, and hopefully you can take that to the league, or even play with some of them. Speaking of being put on a pedestal, you did really, really well at Wayne State. What were your expectations when you went there? My expectations when I first came here was just to help the team. I knew I would be a good player because of my work ethic and my playmaking ability. I knew I would be a decent player, but when you go out there and perform – when I started performing, I realized I really could be a great player… So I put in even more work and more work, working harder and harder in the weight room, and doing extra drills on my own, and doing conditioning on my own, thinking that everything paid off. When I first came in, like I said, I was expecting to be a role player my first year – you know, redshirt – and be the best offensive scout (team player) I could be for the defense. Once I saw how good I was playing against the defense, I was like, wow. We had a very good defense my freshman year. Once I started doing really well against them, I knew that I was ready for this league. At what point when you were playing did you know that you were going to be a big part of Wayne State’s program? Oh, probably my first game of the season. At the time, I didn’t know. Somebody called me and told me, I think after my first game, I led the entire nation in all-purpose yards, which I didn’t know. Just, someone called me, and I said, wow. I checked it out myself, and I was like, “Wow, I really can play with the best.” So, it was kind of – it just kind of took flight from there. A week before my first game, one of the starting positions at running back was a senior. We were battling for it. A week before, we had a scrimmage, and I did better than him in the scrimmage. I think that Monday following, that next week… they made a depth chart and took me from practice running back and put me at first. After that, it was just like clockwork. And which season was that? This is my freshman season. So, as you were excelling and doing better and better, at what point did you start thinking that you were going to get a look from the NFL? Or was that something you were thinking about even before college? Actually, I told myself when I was in my first year of playing football. When I was a little guy, I wanted to do this. At the time, when you’re small, you know, people say, “I want to be a fireman, I want to be a policeman, I want to be a lawyer,” and I thought I wanted to be a football player. Usually, when a kid grows up, he tries to think of what he used to dream about when he was younger, but with me, I stuck with it. When I came to Wayne State, the year I didn’t play – my freshman year, my first year here – I was working for the (Detroit) Lions. I believe the scout for the Lions was walking into the facility. I was working security, and I pulled him to the side. I said, “Can I ask you a question?” and he said, “Yeah, go ahead.” I said, “Do you think a guy can (make it) from a Division II school, like Wayne State University?” And he said, “Hey, if you have talent, they’ll find you.” And after that, that’s all I needed to hear. I took it into my own hands. Let’s go back even further and look at you going to Wayne State. You were a multi-talented athlete in high school. Were there other sports you were interested in, or did you know football was what you were going to play at the next level? Actually, I was a better baseball player. I was a better baseball player, but I just loved football more. You know, it was something that I wanted to do. I played varsity football for two years, varsity baseball four years, varsity basketball three years, and I was varsity track for three years. I also was in band, too, but hey. Going through high school, football season, any extra time I had was all connected to football: either watching film or watching other players, or going out and doing a little workout, going to my backyard and doing sprints in the backyard, just for my sake. You know, I’m more passionate about football than any other sport, so that’s why I stuck with it. Were you recruited to play baseball? No, I wasn’t recruited to play baseball. And even if I was, I wanted to (avoid) it. I could have played here at Wayne State, because we have a variety of players who did football and baseball here, but when I got here, my head coach for the football team wouldn’t let me do any other sport: he wouldn’t let me do basketball, wouldn’t let me do baseball. Strictly, only football. You said you were in band? Yeah. I played the tuba. The tuba? Do you still play at all? Yeah, I can still play. I tell everybody, put the music in front of me, just give me ten minutes to go over the music, and I’ll have it. So if there’s any kind of breakdown with the band at halftime, you could step in if need be? Yeah. Actually, I think they had my high school band come down for my last home game. It was great. Then after the game, I went out there. You know, they do the same stuff they used to do when I was in high school, so I went out there and we did the same – we did the music, we did the steps again. It felt good just to get back some old-time memories. What other schools were you looking at, and what made you decide on Wayne State in the end? I mean, there were a lot of D-II schools looking at me, a lot of D-I schools looking at me. U of (Michigan), Michigan State looked at me. They wanted me for (defensive back), but I didn’t want to do that. So I stuck with playing running back, and Wayne State was the only school that recruited me hard for running back. Because my senior year, right before the season, our quarterback transferred to a different school, so we didn’t have a quarterback. Since I played quarterback my sophomore year, I said, if you need a quarterback, put me back at quarterback. I only played about four games at running back, so I really didn’t have any running back film, but when Wayne State saw the film I did have, they wanted me to play running back. And they were the most persistent and the most genuine coaching staff to come get me, and it was a great decision for me. So what kind of offense did you lead as a quarterback (in high school)? Oh, we ran a spread offense, mostly. We ran spread, we ran pro, we ran off-set, mostly, in high school. When I came here, we had to change it up when they put me back at running back. We did a lot of stuff as far as spread. I mean, we ran a variety of spread, two-back, one-back… We ran Wildcat. Did I say Wildcat? Yeah, we ran a lot of Wildcat. Now, did you run that, when you ran the Wildcat? Yeah, I ran that. I ran that. I think we ran that every year except my freshman year. And what are some things that you see as a quarterback in the Wildcat formation that maybe you don’t get to see as a running back out of the pro? I really get as much out of both, except when it’s a pass formation and I have to read the defense – as far as the DBs and how they drop back, if it’s Cover Three or Cover Two. Other than that, I look at it the same way, because out of the Wildcat, what we do is mostly run. So I want to take my mindset off of being a running back then becoming a quarterback, because in the Wildcat, it’s a running back that takes the quarterback out to take out an extra defender. I don’t want to have that mindset of a quarterback, I want to keep my mindset as a running back, to see that hole and hit it, not dance around in the backfield, get sacked or anything like that… When I’m out there, I don’t think, I just react, because sometimes you don’t have time to think, you just have time to react. Have you gotten to meet with any NFL teams? Yeah, you meet with just about every team at the combine, and then I had a private workout with the Chiefs, and that’s about it. And how did that go? What are the types of things you think they’re interested in? Well, I know that they look for size, they look for speed. They look for good hands, and those other things when they came down for the private workout. Most importantly, they’re looking for conditioning. I was in very good condition when they came down, so I figure everything went very well. In terms of conditioning and workouts, it seems like you haven’t had a great 40 time. How important do you think that is in terms of being a running back? Oh, it’s a difference. It’s a difference. When you look at a 40 time, (compare it to) the guy that’s got game speed. I mean, I don’t have to say it: you look at the great people, some of the greatest in the game ran a 4.6. Jerry Rice never ran anything over a 4.6, but you’ve never seen him get caught from behind. There’s a lot of players. You look at (Frank) Gore from the 49ers, he ran a 4.67… but some guys, their stride opens up after 20 yards. I’m “next man speed,” that’s how I am. So once you get in front of me, I’m going to catch you, or once you’re chasing me, I’m not going to let you catch me. That’s the kind of player I am. Hey, if you look at the 40 time, of course it’s not going to look as great as if you looked at me on film. One last thing, just for our readers I can write it out phonetically. How do you pronounce your name? Conqueror. Okay, excellent. Well, I hope you do some conquering in the next month. Hey, I hope so. I hope so. I wish you a lot of luck, Joique. Thanks for talking to us today. Ben-Jarvis best keep his head on a swivel! Box, I know to some readers you might be committing sacrilege, but their workouts are worth comparing. While BJGE has a better 40 (4.60) and much better bench (24 reps), Joique had much better quickness numbers.